If you are a new customer, just sign up and create a new account, you will then receive 10 points credited into your account. It’s that simple! Please ask your friends to register on Vopmart. Once they successfully registered, you can get points from us. 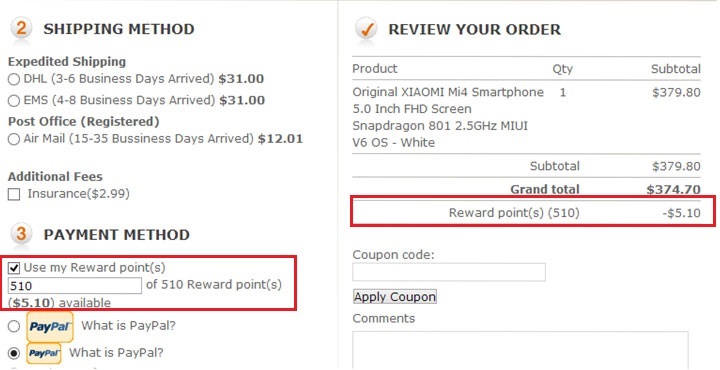 Besides, everytime your friends order from Vopmart.com, you can get the corresponding points. +10 VP Points for normal text reviews. That’s not all: the first five reviews for each product will also receive double these points. We also will send extra VP Points to your account for some special VIP and promotional activities. As long as the VP points in your account exceed 50, you can convert your VP points to cash at a ratio of 50:1 when you make your order. 1.The value of the VP Points cannot exceed 30% of the total product cost (subtotal in the picture). 2.Whenever you shop at our website, and provided your order and payment have been processed successfully, you will receive the corresponding amount of VP points. Please note that if you return your purchase, vopmart.com will deduct the corresponding VP points from your account. Also VP points used for a canceled order will be refunded to your account so you can use them again. 3.If you use VP points or another price reduction scheme to cover some (or all) of the payment total, then you cannot obtain VP Points for that order. 4.VP Points can be used together with our promotional coupons for even bigger savings. 5.The lifespan for VP Points is up to the end of the year, we will reset the VP Points total in your account to 0 at the end of the year. Please remember to use up your VP Points as they cannot be carried over to the next year. vopmart.com reserves the right to amend these rules and provisions. Please feel free to contact us at ourSupport Centerif you have any questions!